Houzz 136 of our visitors have told a friend about this plan. 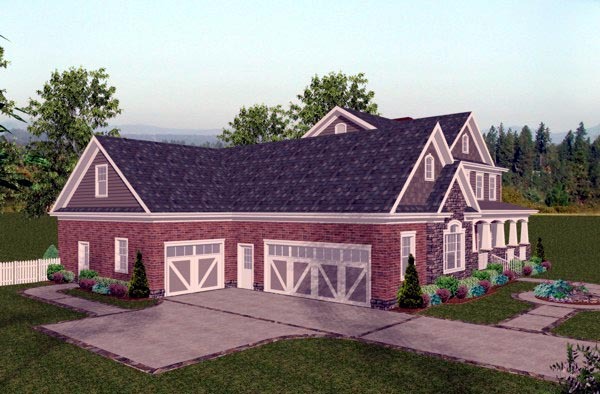 This lovely 2,697 square foot Craftsman home features a split 3-car garage, a spacious front porch and a brick, stone and siding exterior. The entry unfolds to a columned dining room and a home office. The large gourmet kitchen has an angled breakfast nook and a snack bar to provide additional seating and food prep space. Cabinets and shelves in the breakfast area offer pantry storage space. The center island holds a cook-top. A welcoming fireplace warms the two-story family room. The elegant master suite, with a dramatic tray ceiling, is located on the main level. Closet space abounds with his and hers walk-in closets plus a spacious sitting/dressing area. The master bath features separate vanities, a luxurious spa tub and a private toilet room with an oversized shower. Upstairs, the suites are sweet! Each bedroom suite features its own bath, two with tubs and one with a corner shower. All suites have walk-in closets. The biggest surprise of the upper level is the expansive dual bonus areas. The possibilities are limitless as to the use of this delightfully unexpected space! Outdoor living is enjoyed to the fullest with front and back porches and a roomy deck. 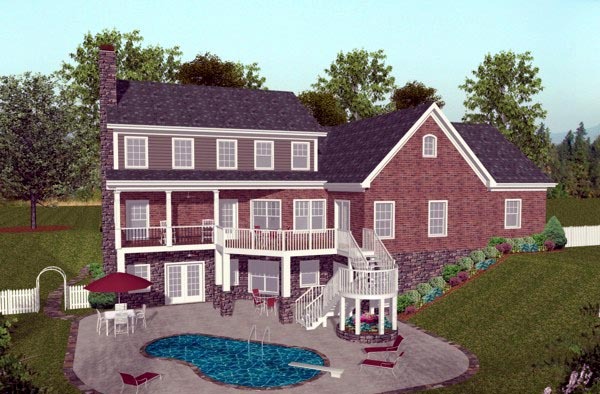 We have featured a small pool in our rendering to help you plan your recreational space. Answer: I regret that there are no interior pictures available for this design. Question: Are there any enterior pics of this house? Answer: I regret that we have no exterior photos on file for this design. Question: What is the head clearance when walking into the rear upstairs bonus area. Right behind the steps. Answer: Bonus room has 8ft clngs in the area between the dashed lines. Ceiling then slopes down to 5ft knee walls. 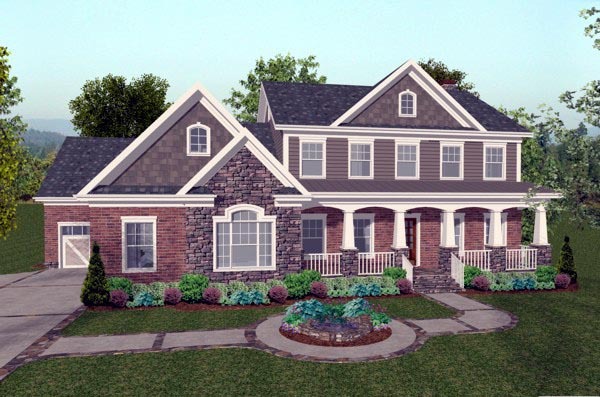 Question: Are plans 92392 and 92391 basically the same plan reversed besides the exterior features? If I was to order the CAD File would it be the same? How long does it take to receive the CAD File in the mail? Answer: Yes, these plans are the same, but they are reversed to fit for different lots. If you order the CAD file, we can e-mail it to you or you can pick the type of shipping that you want. Thanks. Click Here to download a free PDF Brouchure of Plan Number 92392.